My wife and I own a Bosch Axxis front-loading washer and dryer set (WFR 2450/2460 and WTA 4410US). 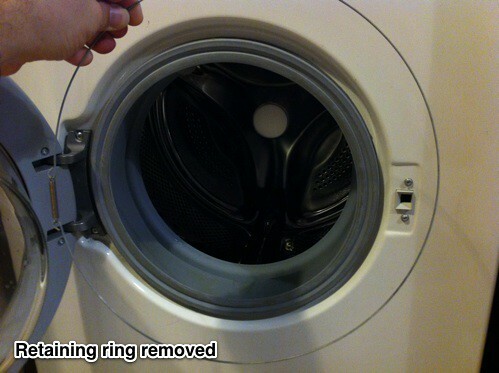 One morning my wife informed me that the washer was not working. It was reporting that the door was open and wouldn't allow a wash cycle to begin. No matter how carefully we opened and closed the door, the washer beeped and displayed "Door Open?" on its LCD screen. Several Google searches later and we were no closer to a solution. Some people reported needing to replace the door switch, others that a new door switch did not fix the problem. Many people also complained about not being able to open the door once the cycle was complete. The solution in our case was probably the best possible outcome requiring neither a new switch nor removal of the washer. The repair was very simple. The door latches into an electric lock, which keeps the door locked during a cycle. 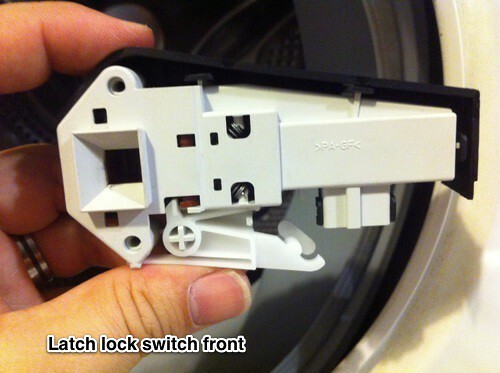 Inside the washer, the door latch has two control cable bundles connected to it. 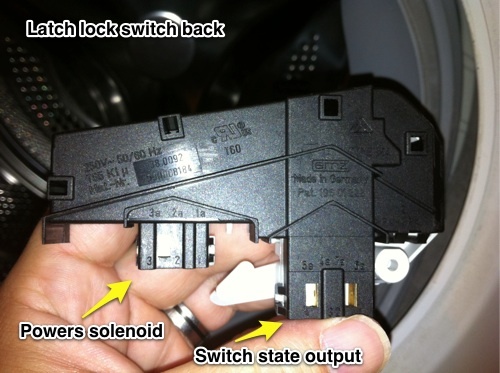 One provides power to a solenoid (a magnetic plunger) which locks and unlocks the latch, while the second cable bundle is used by the washer to determine the state of the latch ("Is it locked?" "Is the door closed?"). Due to someone (*cough* houseguest) repeatedly slamming the washer door shut, the second cable bundle had worked itself loose and was no longer connected to the electric lock switch. This caused the washer to no longer know if the door was closed or not. Re-connecting all the cables to the electric lock fixed the problem. Remove the wire which holds the front of the rubber skirt in place. There is a thin metal ring connected to itself by a spring which holds the front of the rubber skirt in place. The spring is located on the left side of the door, right next to the hinge. Using pliers, grip the wire below the spring and pull down carefully, but with force. You'll need to stretch the spring enough so that you can pull the wire away from under the skirt (it's nestled in groove around the rubber skirt). The flathead screwdriver might come in handy here, if you work it under the wire and pull it away from the rubber skirt. 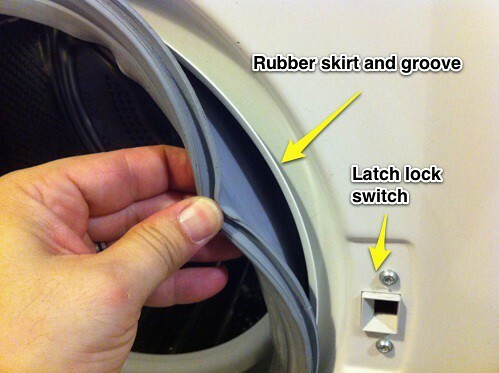 Pull the rubber skirt away on the right side of the door, next to the latch lock switch and push it into the washer and away from the switch. Reattach both control cables to the bottom of the switch, making sure they are secure. Replace the rubber skirt to its original position. There is a groove around the lip of the washer opening into which the skirt fits. When it's correctly seated, the rubber skirt will feel secure and won't have any play. Similar to the rubber skirt, the retaining wire fits into a groove around the skirt itself. I found it easiest to work the wire into the groove by first placing the spring back in its proper location, right by the door hinge and working the wire into place clockwise, using the pliers and screwdriver when needed. Use the 2.5mm hex driver to remove the two screws which hold the switch in place. 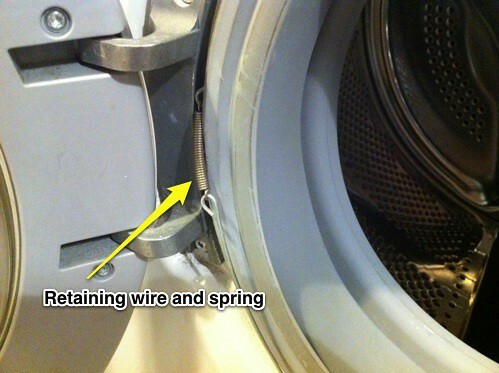 Carefully pull the switch out from behind the steel front of the washer. 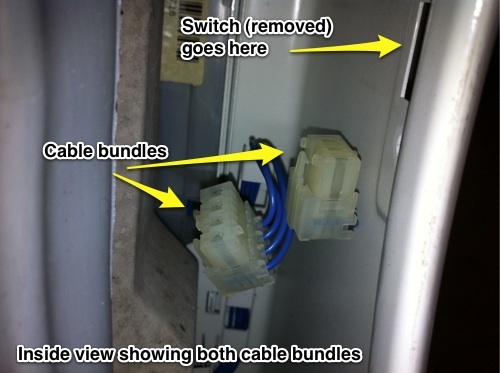 Carefully disconnect the two control cable bundles from the switch itself. The cables aren't very long and there isn't much room back there, so this part is a little tricky. Rotate the switch's bottom arm out of the flat plastic connector to which it's attached. 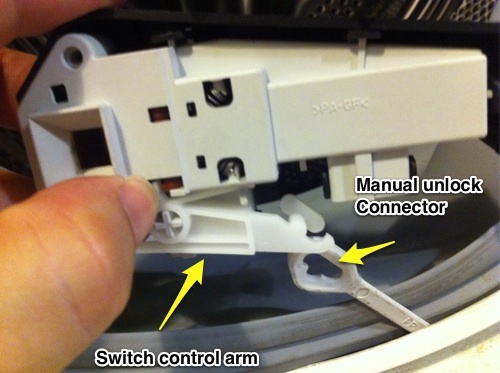 That plastic connector goes to the bottom of the washer, behind a service hatch and can be used to manually unlock the door if the switch failed in the locked position. The switch is manufactured by EMZ Hanauer in Germany, though I can't figure out what the model number is. I've tried doing searches with all the numbers and inscriptions on the switch, but didn't find the actual part number. RepairClinic.com sells the switch, though they have their own internal part and manufacturing numbers, so comparison shopping would be difficult. If anyone knows the actual EMZ part number, please post it in the comments.